Covington Catholic High School said it was closed Tuesday “due to threats of violence.” At AllSides, we’ve written about how media bias fuels real or threatened political violence in America before, and this viral story is just the latest example. Covington Catholic found itself in the middle of a media bias firestorm this weekend after many media outlets and pundits interpreted a short, viral video as showing a group of Covington students “harassing,” “taunting,” or “mocking” a Native American man during the Indigenous People’s March and March for Life protests in Washington, D.C. on Saturday. A longer video clip soon revealed the truth was more nuanced. The media bias had a serious impact on the school and its students. Two Covington students released a video detailing threats the school has received, and Covington Catholic High School "will reopen when [law enforcement says] it is safe to do so," the Diocese of Covington and the school said in a statement. How did media bias fuel threats so serious that it caused a school to close? Here's how it all unfolded. On Saturday, an initial video clip of the incident went viral. 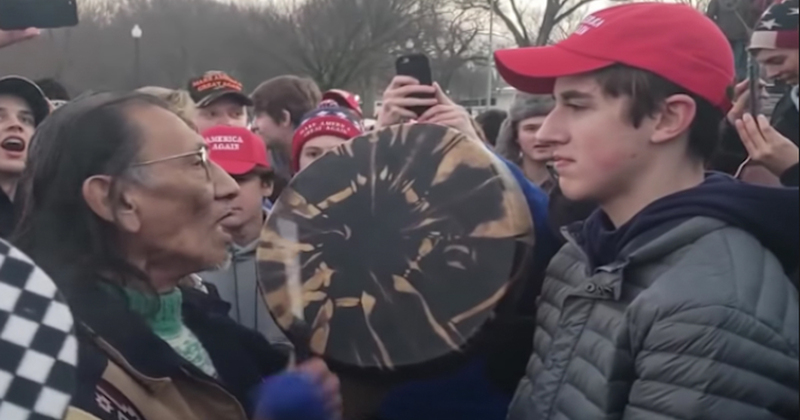 It showed Covington junior Nick Sandmann, donning a red MAGA hat, standing and smiling (or smirking, depending on whom you ask) in front of Nathan Phillips, a Native American member of the Omaha tribe, who banged on a drum. Phillips told the press that the boys “were in the process of attacking these four black individuals.” He equated them with the Ku Klux Klan, saying, "the looks in these young men's faces ... I mean, if you go back and look at the lynchings that was done (in America) ...and you'd see the faces on the people ... The glee and the hatred in their faces, that's what these faces looked like." He said he was trying to diffuse the situation. Many prominent figures quickly endorsed doxxing or expressed thoughts of violence against the boys. Author and public intellectual Resa Aslan tweeted, “Honest question, have you ever seen a more punchable face than this kid’s?” with a photo of Sandmann. After some on the internet falsely identified another Covington student, Michael Hodge, as the one smiling in the video, Hodge's family was berated with threats of violence, their address was posted online, and their business was "slandered and attacked," according to Hodge's brother Andrew. On Monday, Sam Schroder, a senior at Covington Catholic, released a video explaining some of the threats he and other students had received. “There have been many threats against our lives, against our parents," he said. "Some of these include that we should be locked in the school and it should be burned to the ground, the school being bombed, school shooting threats." A longer video of the full incident soon gave more context. It showed the group of mostly white, MAGA-hat-wearing male teenagers remaining relatively calm for over an hour as members of another group on site, the Black Hebrew Israelites, berate them with verbal abuse, calling them “crackers,” “faggots,” and “pedophiles," and threatening to kill one of the black teens. The boys attempt to drown them out by cheering school sports chants. The video offers no evidence to back up Phillips’ initial claim that the teenagers "were in the process of attacking these four black individuals." Phillips can be seen approaching the boys with his drum. The Huffington Post: "New Video Complicates Uproar Over Incident Between Student and Native American Man"
AllSides has written about how media bias fuels political violence in America before, and the incident with the Covington students is just the latest example. Media is often biased, especially online, because it makes people feel good to hear things they agree with. This prompts them to revisit the same sites again and again. Appealing to emotions fuels clicks and shares, which makes media outlets money in the form of ad dollars. In this instance, reporting that the white teenagers had done something indefensible without first having all the context and facts allowed media outlets to craft the perfect partisan storm: confirming biases, fueling anger, and enhancing their bottom line. Media bias shields people from information that would encourage critical thinking about the content they are consuming. This leads to a lopsided worldview and fuels extremism, causing people to decide that the other side is hateful or evil. Some may take things a step further. The response to the intitial story and the closure of Covington Catholic High School shows that the real-world impact of one-sided media bias is that it can fuel actual threats of violence. It would be great if Covington Catholic could reopen its doors to a society that has learned to pause, ask questions, get all the facts, and look at alternative viewpoints before getting angry and upset over what may turn out to be a biased media narrative. It's more likely, however, that the outrage cycle will repeat itself all over again.